And I’m just a critic. With ears. They feel undersized at Big Ears, the annual music and film festival in Knoxville, Tennessee. The Disney short I’m watching is part of Roger Beebe’s experimental eight-screen film projection. At one point, several of the eight projections center on different educational shorts, all running simultaneously, all explaining the mechanics of the eardrum, and all using eerily similar animations of the interior ear. My attention drifts from one screen to another, but I keep returning to the Disney character, perhaps because his child-appropriate explanation of hearing is the most endearing, and easiest to watch, especially as it allows me to keep abreast of what’s going on in the periphery. The flickering projections of thumping eardrums nearby look a little fuzzier when I don’t look at them directly of course, but sometimes the moving shapes are more recognizable than others. No matter what, the images begin to combine and dance in front of me, and my ears soak in all the sounds, hearing about hearing and hearing about hearing, and the experience begins to make me acutely aware of how my body’s anatomy allows me to take this all in. I can literally feel my eardrums thumping away. While I had to do a fair bit of cognitive multitasking to take in Beebe’s "Films for One to Eight Projectors" (not that I’m complaining), Big Ears itself doesn’t require a lot of multitasking. There’s a lot of stuff going on at once, sure—it features 26 cinematic experiences and 37 musical acts in a stacked four-day-weekend—but it’s surprisingly manageable to bounce from one thing to the next and see a lot all at once. There are a few reasons allowing for such venue-hopping ease. For one, many of the scheduled films are quite short (in addition to several experimental short programs, the festival offered retrospectives of Jonathan Demme and Jem Cohen’s work). Secondly, the venues are quite close to each other (at most you might be walking 15 minutes). And since there are so many musical acts and crowds run small, it’s easy to slip from one performance to another half-way through, then dash off to an hour-long experimental film program, followed thereafter by chowing down some barbecue or burgers for dinner in the downtown’s market square, before settling in for “Stop Making Sense” or “The Silence of the Lambs” to finish off the night. Big Ears is not your typical multi-art festival. It doesn’t try to shoehorn in connections between the different arts, it doesn’t try to connect them in inauthentic ways—every piece of programming is just naturally about a shared connection between music and art. The film programming is directly about, plays off of, or features music in some capacity, often in experiential ways. Often, its music programming feels downright cinematic. Watching a Demme concert film on 35mm in the Tennessee Theatre (a gorgeous, pristine movie palace) is a lot like being at the concert in person. That’s how I felt when I saw “Storefront Hitchcock,” Demme’s intimate film of a Robyn Hitchcock performance shot behind an abandoned shop window. It made me feel less guilty for missing Robyn Hitchcock’s actual performance at the festival, though the English singer-songwriter did introduce the film, explaining that when the movie came out, he was told by people that he didn’t smile enough in the film, so he’s since put more effort into smiling. That reminds me—acting, theatre, those are things that Demme likes to shoot too. So Big Ears connects (quite seamlessly) a third performative art into its festival, with its inclusion of lesser-known, lesser-shown Demme films like “Who Am I This Time?,” “Another Telepathic Thing,” and “Swimming to Cambodia.” “Who Am I This Time?” is the most memorable of the three, about a pair of star-crossed lovers, played by Susan Sarandon and Christopher Walken, and featuring one of the steamiest onscreen chemistries in the history of cinema. The couple can only communicate their love to each other when reciting lines from famous plays. 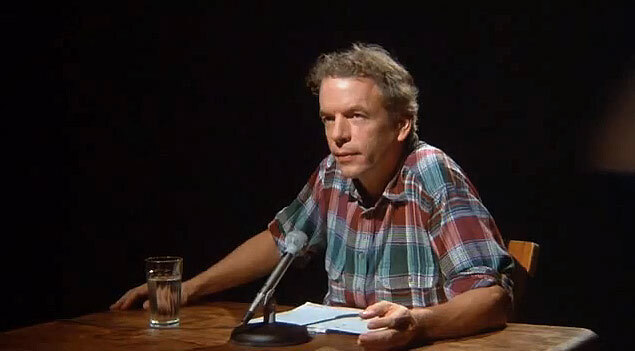 Then there’s “Swimming to Cambodia”: I didn’t just feel like I was watching Spalding Gray perform his one-man show, I felt like I was actually sitting right in front of him, only a foot away from his face, as he manically narrated his experiences in Cambodia. That’s the power of Demme’s cinema—he knows how to tap into the beauty of his subject and reveal an intimacy that makes you forget you’re even watching a film. To stand by the bridge and look down at the people, and then at the projection, if only fleetingly before heading off to my next venue, I couldn’t help but notice how deeply affecting even a walk-by experience could be. Experiential is the word when it comes to Big Ears. Ironically, the experiential requires more than just the ears, it demands all the senses to feel it. The best artists know how to masterfully tap into all the sensory inputs when creating their own unique experiences, and I witnessed this time and time again by musicians, filmmakers and actors alike. Gray’s verbal, affected description of nearly drowning in Cambodian waters in the Demme film, for example, felt so real to me I was gasping for my own breath as if I were the one drowning. The musicians in Colin Stetson’s reimagining of Henryk Górecki’s 3rd Symphony were all so emotive during their performance that one could not help but want to openly weep, too. I’ve never seen a guitarist become so physically exalted while plucking a single chord, or a singer (Megan Stetson, Colin’s sister) patiently wait between her parts as a single tear rolled down her cheek. Or what about Nathan Smith’s installation “Ride Or Die”—an experimental commemoration of the melancholic public grief over Paul Walker’s death, featuring Vin Diesel singing Rihanna’s “Stay”? It was deeply touching in a way that no one could have anticipated from an installation featuring footage from a franchise as commercial as “Fast and Furious.” The bromantic images from the movies rolled along multiple projections, honing in on the happy, loving expressions the two actors shared onscreen through their ensemble work. Sometimes the experiential is not necessarily about emotion or the intensity of it. One does not need to reveal the depths of their soul every time, like Walken’s character Harry in “Who Am I This Time?” naturally does each time he acts in the local play. Sometimes, it’s about reaching another state of consciousness. I felt this way while watching many of the experimental shorts in Darren Hughes’ Flicker and Wow programming, including Kalpana Subramanian’s “Empyrean,” her interception of mediated light emanating from screening projectors of various 16mm prints of Stan Brakhage’s films. I felt like I was swimming in a pool, meditating through a warm body of blue, sparkly water. Or seeing Norwegian ambient/noise musician Helge Sten’s solo project “Deathprod” at the Tennessee Theatre, which, despite its massive size, became entirely blanketed by the intensive fog of noise that overtook the palace. The sound moved through you, sometimes painfully so, but it also felt meditative, even relaxing. I described it as going through a car wash, getting a dental cleaning, and receiving a deep-tissue massage all at the same time. Painful, yes, but reinvigorating, too. The experiential requires you to let go. In Meredith Monk’s “Book of Days,” construction workers strike down a wall and reveal something of an historic portal into the Middle Ages. We peer slowly but surely through black doors that take us back to the days of the plague. The film often poses contradictory juxtapositions—e.g., historic objects of those times mixed in with modern-day objects, and questions of a 20th-century sort posed to the peoples of the Middle Ages—to reveal the horrors of that particular era. The films makes a lot of sense by using a lot of nonsense, but in order to appreciate it, to understand Monk’s work, in order to see past the darkness of the beckoning historic doors, you must learn to let go. You must let it wash over you. You must become free of logic, in order to see the imaginative. Next Article: Roger Ebert and Empathy to be Commemorated on April 4th in Chicago Previous Article: Video Interview: Jessica Chastain and Niki Caro on "The Zookeeper's Wife"